The festival will return to a competitive format this year. Ratings and our usual 25 minute clinic will still be included. JazzFest 51 will be held on Saturday, February 23, 2019 in Baldwin Hall on the Campus of Truman State University. Since the chapter was founded in 1968, Upsilon Phi has hosted an annual event celebrating jazz at Truman State University. 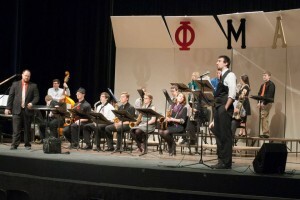 Having been been ranked one of the top collegiate jazz festivals by Down Beat magazine, the Phi Mu Alpha Jazz Festival has become one of the larger events of its kind, attracting high school and middle school bands throughout the Midwest. Traditionally held the last weekend in February, “JazzFest” brings in nationally renowned artists every year. It includes a day of performances by high school and middle school jazz combos and big bands with a personalized clinic for each group. Our guest artist also presents a clinic and performs with Truman jazz groups on an evening concert. The list of past guest artists reads like a who’s who of jazz luminaries. Clark Terry, Nick Brignola, John Fedchock, Danilo Pérez, John Faddis, Peter Erskine, Ethan Iverson, and Slide Hampton are just some of the great musicians who have graced JazzFest with their talent and generosity. For a complete listing of past guest artists, click here. The men of Upsilon Phi take great pride in all the hard work required successfully put on such a large-scale festival every year. Not only does JazzFest support a rich American art form, it also helps educate aspiring young musicians.